Road users frequently ask “Who has right of way?” in particular circumstances. 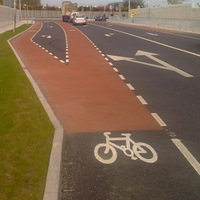 Under Irish law, all road users have equal right of way. Rather, the question is “Who is expected to yield their right of way?”, as opposed to “Who has right of way?”. All road users, including emergency vehicles and cyclists alike, are expected to proceed with due care and consideration for other road users in all cases, irrespective of who has right of way. At priority junctions, all main road traffic may generally expect traffic turning on or off the main road to yield. This expectation is tempered by the obligation to exercise due care and attention. Buses and taxis are entitled to use bus lanes, but this does not confer absolute right of passage. For instance, if cyclists are in the bus lane, due care and consideration may require drivers to remain at a non intimidation distance behind the cyclist. Cyclists are also bound to exercise due care and attention to other road users and themselves. Erratic, unpredictable or inconsiderate behaviour may cause accidents. The solutions offered in this manual have been developed based on the above.